During the recent Scottsdale race for mayor, I wondered if mayor candidate David Ortega was architect David Ortega who had worked closely back in the early 80s with nationally-recognized Arizona architect Bennie Gonzales. If so, possibly he could solve the mystery as to who designed the Boulders Resort. I had heard for years that Bennie Gonzales was the architect of the popular resort and mentioned it in a former column (January 23). Gonzales is famous for adobe-style architecture - a defining feature of the Boulders. The Scottsdale Civic Plaza, the Scottsdale Conference Center, three Arizona community colleges, and prize-winning houses were all designed by Gonzales. 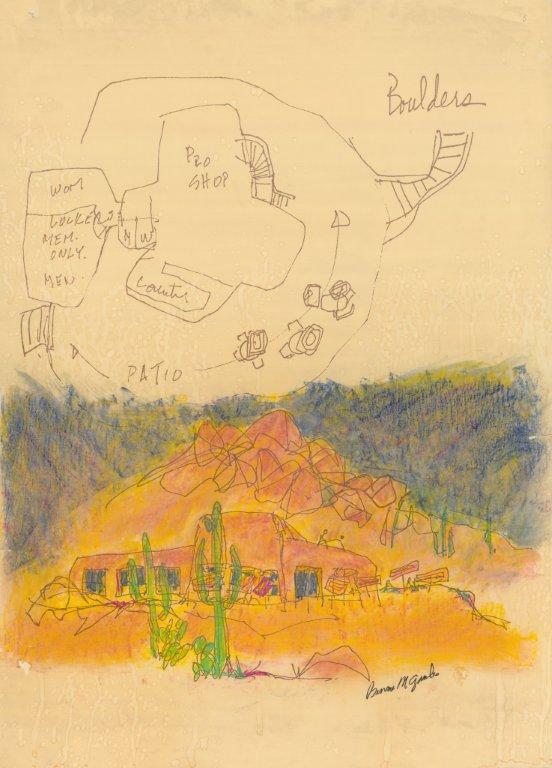 One of his Paradise Valley houses was featured in a 4-page spread in Life Magazine. Thus, I was stunned to hear from reputable architect Ken Allen of Allen & Philip that his firm, not Bennie Gonzales, had designed the Boulders. Allen & Philip has been responsible for impressive architectural achievements such as the Fairmont Scottsdale Princess Resort, the Sanctuary, and the new Spa at Camelback Inn. I believed Allen and apologized for my error. However, after calling the Boulders and then checking the Internet, I became perplexed. The concierge at the resort claimed adamantly that the true architect was Bob Bacon. Also, many articles on the Internet give credit to Bacon. Allen elaborated that many individuals in his firm had worked on the project that had been conceived and initiated by developer Rusty Lyon. Bacon had been the firm’s lead designer, but has never been a licensed architect. Bacon left the organization to go on his own while the Boulders was being built. Allen remembered that Gonzales had completed a prior study, but that it had not been shown to anyone in his firm. According to Allen, Lyon had rejected that study and his organization’s design was original. Then I talked to David Ortega. He recalled that he had worked with Gonzales on the golf clubhouse and other components of the Boulders. He explained that something happened unexpectedly that caused Gonzales to drop the project and close his doors. Ortega put me in touch with Gonzales. Now nearly 80 years old and living in Nogales, Gonzales explained that the Boulders Resort was built in accordance with his original plans. He made clear why there was such confusion over the issue. Gonzales was going through a divorce at the time he created preliminary plans and a model for the Boulders. The judge awarded his ex-wife the profits he would make from the project. This forced Gonzales to abandon the design because completion of it would have cost him money. According to Gonzales, Lyon was very disappointed because he liked the plans very much. Gonzales mentioned further that during that same time period designer Bacon was working on the interior of a mall for Lyon and had access to Gonzales’ work. Officially, Allen & Philip is the architectural firm that designed the Boulders. However, there is considerable disagreement concerning who originated the design concept of that magnificent resort.